Although there are several services available to shorten url, but Google URL Shortener is the clear leader among all of them. Whenever we feel any need to shorten any of the URL, we just move to this Google URL Shortener service. Many of the people maybe wondering about the reason to use this url shortening service, don’t worry TODAY we are here to discuss each and every aspect of this URL shortening need and way. Here, we will discuss, Why to shorten url’s ?, How to use Google URL Shortener service ?, its main features and some frequently asked questions (FAQs) about it. Why there is need to Shorten URL ?. First of all you have to understand the need to shorten the URL’s. Although there are many reasons or benefits to shorten the Links, some of the most important reasons are listed below with explanation. Mostly it is used to reduce the length of any link, which in return will make the link, easy to remember. easy to read and easy to share it anywhere. This shortened URL will provide additional protection to your link, or will be a mask to your URL. Basically, this shorten link just redirect the users to the original link. Any bad reputation acquired by this shorten link will never reflect to the original link, it will always remain safe. Shortening URL is the Must Do activity for any successful social promotion. Now a days, without doing any social promotions for the business it’s very hard to survive in the market. While performing these social promotions, people do many mistakes which are unrecoverable in nature. One of these unrecoverable mistakes is Spamming (posting the link in access to not related audience), which in return harm the reputation of your link badly. Even search engines also prefer to neglect these type of spammy links declared by the social media. In addition to this, these shorten links are very useful to promote anything on twitter too, remember twitter doesn’t allow to post long URL’s to it and most of the times it shorten the URL itself. We hope you have completely understood the importance of these shorten URL’s for social promotions. 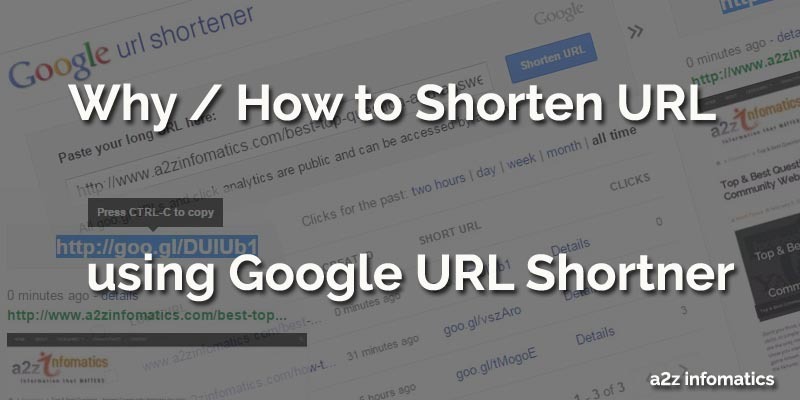 How to Shorten URL using Google URL Shortener. 1)- Type goo.gl in the address bar of your browser and HIT Enter. Important: You always have to be logged in to your google account here, otherwise you will perform these doings anonymously. Performing this task anonymously will not provide any control over the generated shorten url. So we recommend you to stay logged in while generating the shorten url’s. 2)- Now you have to write / paste the long url in the text box under “Paste your long URL here:”, Click “Shorten URL” button after providing the url to the text box. Congo!, You have successfully created the shorten url for the provided long URL. You can freely use this generated shorten url anywhere. Why to use Google URL Shortener ? Very simple question 🙂 . The answer for this is, Due to its fantastic analytic data about the shorten URL. You can check all the related stats about shorten link by following ways. If logged into the google account, check “Details” option, placed next to the file you have shortened. If checking this anonymously, You have to add “.info” to the shorten URL. For easy understanding, If the shorten URL is “goo.gl/tMogoE”, You can check its analytic data by visiting to “goo.gl/tMogoE.info”. Offcourse Yes, anybody can check these stats for the URL even if your have generated it using your Google Account (Logged into the Google Account). In simple words, for shorten url’s generated using Google Shortener, anybody can view analytic stats / data for any shortened URL. Here, we are demonstrating the Shorten Link for Google website (goo.gl/fbsS). To check the analytic data for this short Google’s short link we have added “.info” to the end of it. Now it look like, “goo.gl/fbsS.info”. Yipiee!, the complete analytic data is on our screen and shown in the picture below. Important: Here you can view, Referrers for the URL, Browsers used to access the URL, Countries from where the Shorten URL has been accessed, Platforms used to access this Shorten URL. We repeat, anybody can access this anonymously. And don’t worry about the Link preview for this Short URL, it will be the same as of your original URL. 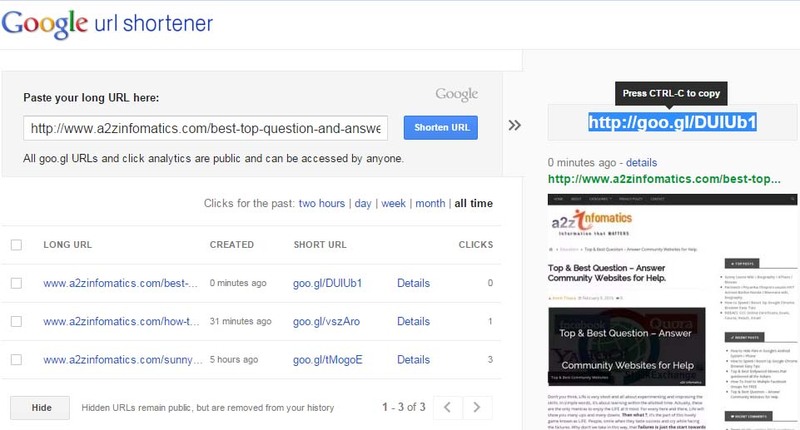 Frequently Asked Questions (FAQs) related to Google URL Shortener. How many shorten URL’s I can generate for the same long URL ? You can generate unlimited number of shorten URL’s if generating those being Logged-in to your Google Account. In addition to this, you will get the unique (different) Shorten URL every time you generate that for the same long URL. If generating the Shorten URL anonymously, you will get the same Shorten URL everytime. For easy understandings, the Shorten URL will be the same for all the users if generated anonymously. We hope this has cleared many of your doubts. Do these Shorten URL’s have any Expiry time or period ? Don’t worry, under normal circumstances these Short URL’s will never get expired or suspended after generation. They may get expired or suspended, if these URL’s violate any “Google Shortener Policy”, or if the link is reported as SPAM or ABUSE by anybody. Google people holds the rights to suspend any Shortened URL anytime, if the URL isn’t following or under the Google Policies for the Shortener. Important: Please ask any of your questions under the comments section below. It will be our honour to reply them. That’s all we have related to URL shortening. 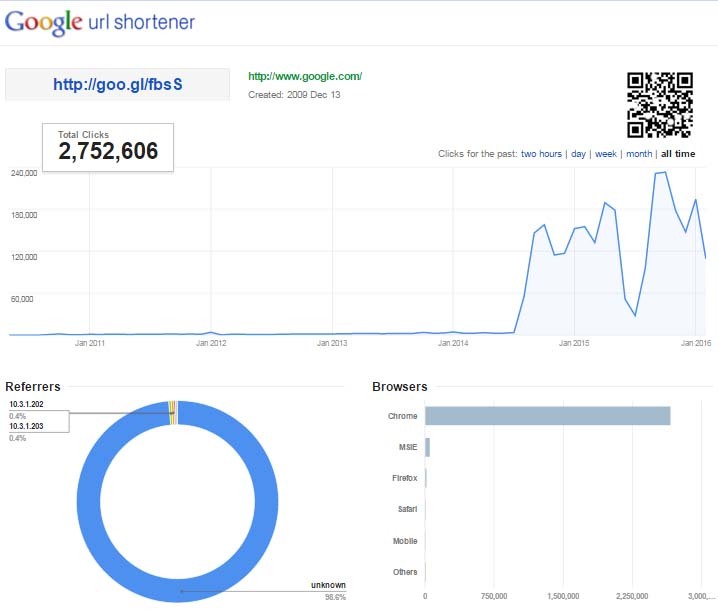 We hope you have fully understood every single thing related to the Google URL Shortener. Believe us, shortening url’s will surely add a new dimension to your social promotions. Give it a TRY and share any of your experiences with the Internet Community too. Thanks for the readings. God Bless Everybody.